The Outer Limits was a black and white science fiction television series that ran on ABC from 1963-1965. It was heavily influenced by The Twilight Zone, though the series eventually became influential in its own right, going on to shape several elements of the television series Star Trek. Forrest T.Butler and Sabine Manela are the two costumers credited with working on The Outer Limits series, though it is not known if the above helmet originated with them or this production. 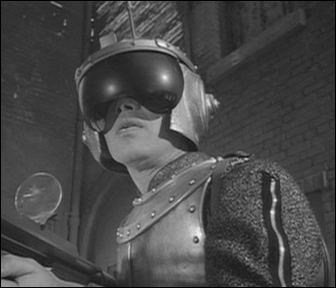 The first known appearance of this space helmet was in The Outer Limits episode entitled Soldier, which aired in 1964. It was worn on Michael Ansara as Qarlo Clobregnny. 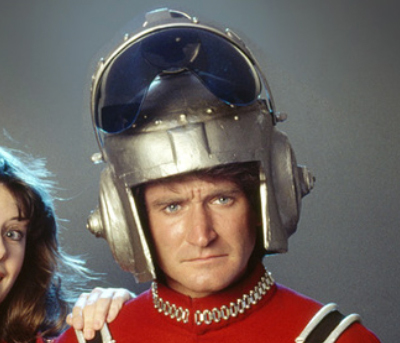 The helmet must have gone back into the studio’s costume stock, because it appeared again several times in the ABC television show Mork and Mindy, which ran from 1978-1982. It was worn as a part of the space uniform worn by Robin Williams as the character Mork.